I finally got to meet Anna Creech as well as a bunch of other great librarians when I was in Oregon. Anna has some notes from my talk as well as the two other speakers who gave presentations on the first day, Anthony Bernier and Rachel Bridgewater both of whom gave really interesting presentations that I was delighted to find myself sandwiched between. 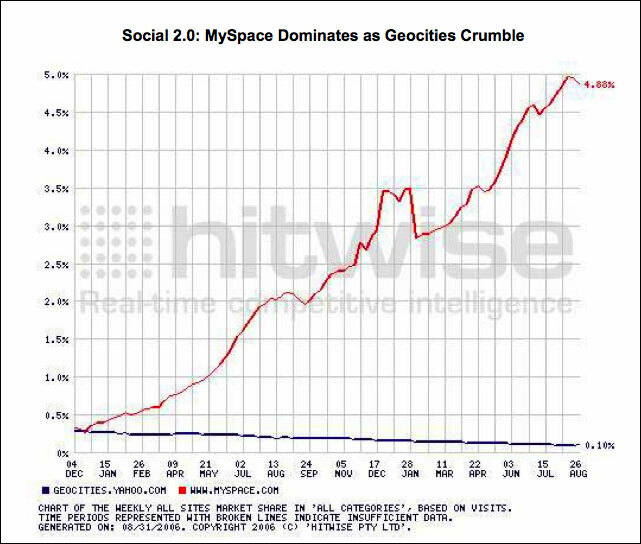 All of us spoke a lot about recent data from the Pew Reports, many of which I was copying and pasting graphs from into my talk at the last minute [see geocities vs. myspace and encarta vs. wikipedia] and I even got to mention the Digital Divide a little. I was sorry that I wasn’t able to include information from Speed Matters, a site set up by the Communication Workers of American urging that the US develop a comprehensive broadband policy to ensure equitable broadband access for everyone. I just learned about the site from FreeGovInfo which discusses some of the different ways we still have a digital divide. There is an income digital divide: more than 62% of households with incomes over $100,000 subscribe to high speed broadband at home while just 11% of households with incomes below $30,000 subscribe. There is a rural/urban digital divide: only 17% of adults in rural areas subscribe to broadband compared to 31% in urban and 30% in suburban areas. And there is a farm/non-farm divide: only 15.8% of farm households have adopted broadband. Here’s some specifics about the Vermont situation and Verizon’s plan to sell off local access lines in Vermont, New Hampshire and Maine. Here in Vermont that’s about 85-90% of the state’s phone lines. While I loved living in Topsham with our local telephone company Topsham Telephone, there’s a real problem when big businesses who were given favorable legislation to obtain monopolies in industries like telecommunications are then allowed cherrypick and jettison the less profitable areas. This will affect me personally, as well as people in my town and county who are still waiting to have DSL available in their locations. As we learned from the Pew Reports, people who have faster connections do more online. More government information and resources are being moved online. More online content is becoming inaccessible to people who only have dialup connections. Getting broadband to the libraries is part of the equation, and an important part, but what are our other obligations to get our patrons and our neighbors on to the information superhighway at speeds that are adequate to do what they need to do? No no, please do. I think it’s a very striking example of web 1.0 vs web 2.0. 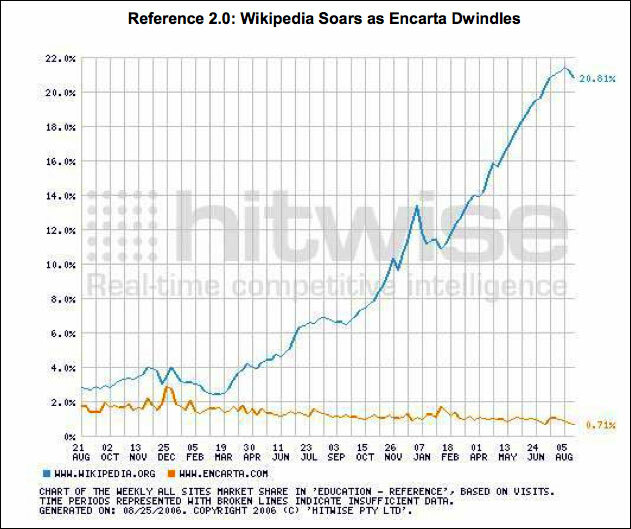 I mean the other thing worth noting is that a visit to Wikipedia usually involved an awful lot of visits, reloading etc, whereas Encarta is more of a destination site, so there will be some traffic inflation just for that, but yeah, let the numbers speak for themselves. I just read a new of Pew’s Internet reports–very interesting and useful for someone (me) who’s working on a business proposal/investment prospectus with my husband for his new business–a rural Wireless Internet Service Provider (WISP). We’re located in NNY and if we can fend off the “big biz” telecommunications firms, we think Wireless Internet can make real progress for the rural/urban “digital divide” where we live (and in other rural areas). Simply getting access to put (our) equipment on telephone lines is NOT easy! But up here, it’s National Grid (formerly Niagara Mohawk). I urge others to support small ISPs and WISPs whenever they can! Just the other day, we switched someone from a deathly-slow dial-up connection (often rural dial-up goes even slower due to OLD-OLD-OLD lines/infrastructure) to our high-speed wireless. Now, instead of waiting UP TO 30 MINUTES for 1 PAGE TO LOAD, they are happily surfing away at high speeds (and telling their neighbors, we hope!). A cable company (or DSL?) had recently told them that it would cost upwards of $50k for them to â€œbuild outâ€ onto their country back road. (Which means they donâ€™t want to be bothered; not enough profitability). I have a feeling this often happens to small rural libraries. We wanted to advertise our WISP on the bulletin board of our local library and they said NO; only non-profits allowed. We joked, â€œWell, we havenâ€™t turned a profit yet, so technically weâ€™re non-profit, right?â€ They didnâ€™t oblige…(or laugh). Thanks, JW. Love your haircut, too!